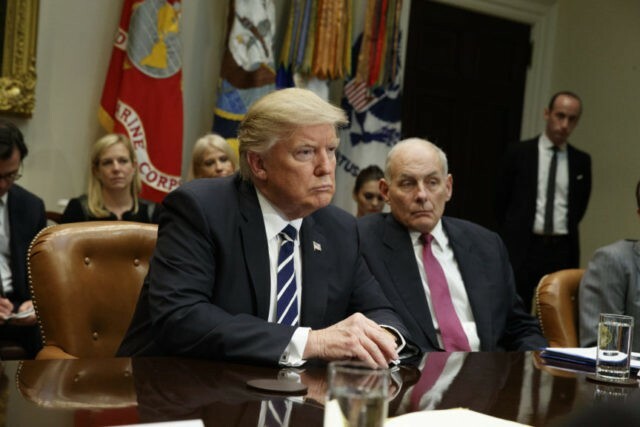 President Donald Trump’s Chief of Staff John Kelly and his Never Trump bureaucrats and globalist minions are ensuring that Trump’s “exposure to populist nationalism is now close to zero,” according to an Axios report that details how Kelly is isolating Trump from the concerns of working-class Americans of all backgrounds and parties who got Trump elected. Since former White House Chief Strategist Steve Bannon left the White House, Trump has caved on Deferred Action for Childhood Arrivals (DACA), reportedly is thinking about staying in the Paris Climate Accord, has palled around and made deals with Senate Minority Leader Chuck Schumer (D-NY) and House Minority Leader Nancy Pelosi (D-CA), and supported increasing the number of U.S. troops in Afghanistan. “So if you wonder why President Trump has been willing to seriously entertain — and in one case so far, execute — policies that would’ve been anathema to Campaign Trump, it’s partly because of the feedback loop built by Chief of Staff John Kelly and the process adhered to by the national security team before briefing Trump,” Axios’ Mike Allen wrote in his Tuesday AM newsletter. Allen further pointed out that Kelly and “Staff Secretary Rob Porter pick and choose what information gets to Trump and who’s allowed to weigh in, that’s supreme power.” Kelly’s deputy, Kirstjen Nielsen, is also a globalist bureaucrat who has no idea about what concerns Trump’s coalition of working-class Americans and what got Trump elected in the first place. She now symbolically occupies Bannon’s office. Trump’s willingness to publicly entertain an immigration deal that doesn’t include funding for the wall would have been unimaginable to Campaign Trump or Travel Ban Trump. No administration official we talked to at the time thought that Trump was being sincere when he originally said he’d be open to staying in the climate deal if more favorable terms were offered to the U.S. On Sunday, Trump officials were on the shows saying exactly that. Trump’s decision to raise troop levels in Afghanistan is testament to the power of a unified, controlled info flow to Trump. National Security Adviser McMaster, SecDef Mattis, CIA Director Pompeo, SecState Tillerson, et al. were all on the same page and they kept showing Trump — with highly detailed and planned presentations — why it’d be a disaster if he presided over a troop drawdown like Obama in Iraq. “Part of the reason he kept veering was because he had Steve Bannon in his ear,” he continued. The former White House Chief Strategist who had a whiteboard in his office with Trump’s campaign promises on it worked, as former Chief of Staff Reince Priebus said, “24 hours a day” for Trump’s economic nationalist agenda that enabled him to shock the world in 2016. Axios also noted that after Trump’s decided to make a deal with Schumer and Pelosi on DACA, he enjoyed the “positive media coverage and coherent reinforcement from his top aides.” It goes without saying that Trump probably did not receive Breitbart News’ John Binder’s superb reporting on illegal immigration and DACA, which is much different than the DREAM Act, that could have better informed Trump. Breitbart News’ Neil Munro also pointed out that Kelly ensured that Trump “was literally surrounded by amnesty boosters the night he agreed to give away a huge, expensive and unpopular amnesty in exchange for an empty bag of ‘border security’ promises.” Kelly seated Trump next to Pelosi and Schumer and ensured that Marc Short, who used to run the Koch brothers’ pro-amnesty group and worked for “Gang of Eight” Sen. Marco Rubio’s (R-FL) presidential campaign, was also at the dinner. As Ann Coulter, one of the most loyal Trump supporters who has been a fearless and fierce champion of Trump’s agenda (memo to Trump: Dance with the one that brung ya! ), recently told hosts Rebecca Mansour and Joel B. Pollak on Breitbart News Sunday on SiriusXM Patriot Channel 125, Trump ran on an America-First agenda but “suddenly Goldman Sachs and Rubio staffers [and their fellow Never Trumpers] are running everything” in the White House.